Enik Rising: Imagine no campaign donations. It's easy if you try. Imagine no campaign donations. It's easy if you try. Imagine, for a moment, that you didn't need to raise money to run for office, that the government would pay you to run. Who would that help? Would it encourage more moderate candidates, who are usually pressured out of nomination contests by party money because they don't stand for anything? Or would it enable the extremists, whom are normally de-funded due to concerns about their toxic views? Clean-funded legislators were more ideologically extreme relative to their districts and parties than traditionally-funded legislators were. The extremism difference faded with time, with clean-funded legislators becoming socialized after several sessions to mirror the views of their traditionally-funded colleagues. These findings suggest that it's the more ideologically extreme candidates who take advantage of clean funding to run for office. Under the traditional funding system, party donors function as gate-keepers, reducing the power of extreme candidates by channelling money away from them. Take away the gate-keepers, and it's the extremists who break through, contributing to the polarization of the legislature. In either Maine or Arizona, did non-party PACs play a significant role in elections? They would seem to be an alternate way of bypassing gatekeepers. There is a counter-example in judicial appointments that sheds light on some of the mechanism. There are basically three ways of appointing judges: elections, political appointment, or something like the Missouri plan which uses a civil service like vetting process and leaves politicians with a choice only from the final three (Colorado used the last method, the federal courts have political appointments, and many states like Arkansas have elections). A Missouri plan does produce the kind of people that "clean campaign" proponents hope for. 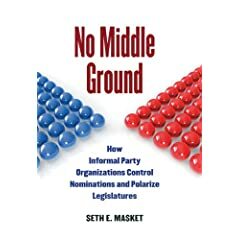 Political appointments produce the most extreme candidates because political considerations are the only considerations. But, in the case of elections, the system excludes people who are ideological but don't have enough of a network to create viable campaigns and fundraising (even when money is not an issue elections still mean recruiting and organizing lots of grass roots poeple) both of which means personally winning of lots and lots of individuals who are quite savvy rather than just a handful of politicians. I suspect that clean campaigns elevated the power of political insiders who are relevant in the nomination process who previously had to share power with check writers who had more pragmatic objectives, and hence greater extremism resulted. Another comparison point is today's NPR report on the relative fundraising return of seats on different committees in Congress. The worse of all is to be a rank and file member of the Justice Committee that is reserved to party ideological loyalists since it handles ideological charged issues that don't necessarily matter much in dollars and cents to businesses (leaving the incumbents with less room to be influenced by money and less return to provide to donors on the issues they deal with); the "boring", less ideological, big money posts (e.g. Ways and Means) rake in the big money since they have more flexibility to respond to donors and more raw dollar impact at stake. Indian Packers and Movers in Mumbai offers a superior packing and moving experience to residents and offices in Mumbai.